Please use the contact form below or contact OAG flightview directly and we will be happy to help with your query. Real-time flight information you can act on. FlightView's® full-featured flight tracking apps for leading smart phones put real-time flight status and airport status right where you need it - in the palm of your hand. Track upcoming and in-air flights, and receive status alerts via push notifications. Check gate assignments, delays and cancellations and use the attractive flight tracker map to see a flight's progress. Forward your itinerary confirmation emails, and FlightView® will automatically load them into you're 'My Trips'. 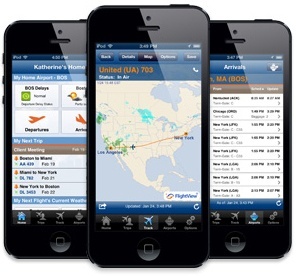 See your trips across mobile devices and at www.flightview.com. In the Elite version, view Flight Boards at major airports to quickly see a list of upcoming arriving and departing flights. How do I email my trip to myself or someone else? How do I add a trip? How do I add a flight to a trip? How do I delete a trip? How do I delete a flight from a trip? How do I see the detailed flight status for a flight in a trip? Why do I need to add multiple email addresses to my FlightView profile? What is a 'primary' email address vs. 'alternate' email address? How far into the future can I track and save a scheduled flight to a trip? OAG leverages the world's largest network of air travel data to provide accurate, timely, actionable digital information and applications to the world’s airlines, airports, government agencies and travel-related service companies.